Allows you to engrave nearly anything you can imagine on any surface! The Engrave-It Pro engraving tool allows you to engrave nearly anything you can imagine on almost any type of surface: wood, metal, plastic, leather, glass, personal devices, computer and much more. Do you know that Law enforcement won&apos;t return stolen property unless it&apos;s identifiable? 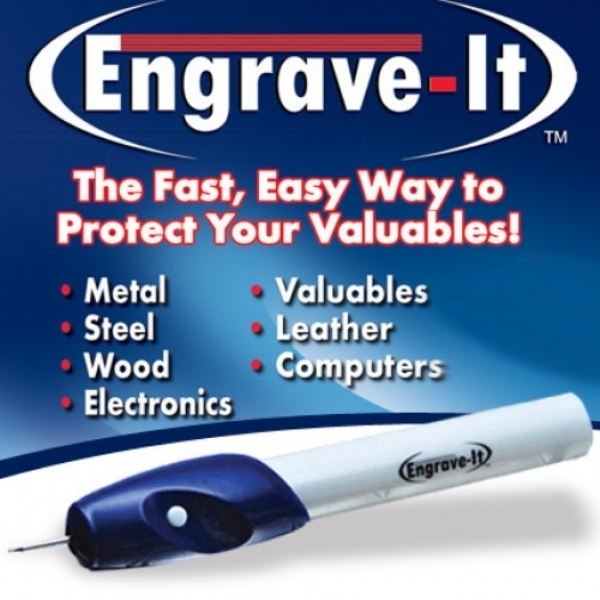 Use Engrave It Pro as seen on TV to permanently label and protect your valuables. Engrave tools, bags, keys, trash cans. Includes three plastic templates with numbers, letters, and shapes to make engraving easy. Change an ordinary glass mug in to an extraordinary mug with Engrave It Pro. Requires 2 AA batteries (not included). As Seen On TV Engrave It Pro is the fastest way to protect your valuables! I want to know how to order the replacement tip or where to find it. If I am find my receipt for purchases, I am able to identify it with my special markings.